Solid Brass urn in Lavender and nickel finish. Hand etched design, Maintenance free. Comes with a screw on top lid and a felt lined base. Height: 10.5", width: 7". 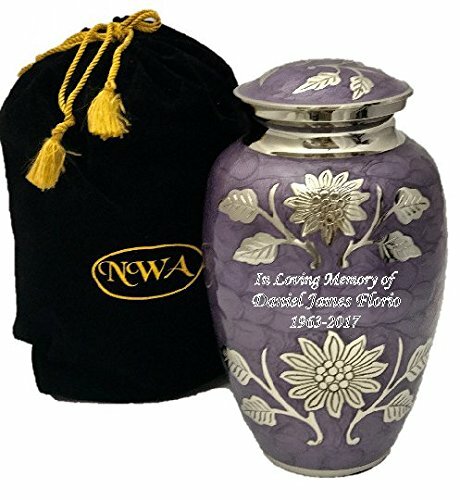 Can hold up to 220 pounds of body weight before cremation A beautiful black velvet bag also comes with it. Comes with a screw on top lid and a felt lined base. Hand etched design, Maintenance free. Please select the option to customize the product before adding it to cart. Please say "NO engraving" in the text box if don't want to personalize it.